Hello, my name is Gabriele Monetti, and as a new member of the Triangle Bonsai community, I have spent the last couple of years learning how to grow and train and appreciate good bonsai. So, I have asked my good friend, Harold Johnson, who has a lot more experience in the art than I do, to give us newcomers an introduction into the art of bonsai—some advice to get us started, how to proceed through the first few years, possibly how to get the right supplies up front and not make some of the mistakes that many bonsai enthusiasts make up front. Harold, let’s start with your experience. How and when did your love affair with bonsai start? Quite by accident–my wife and I were in Charleston, South Carolina at the market place, saw this cute little tree, bought it, killed it, and fortunately as it was breathing its last breath there appeared in the newspaper an evening class on bonsai at a nearby middle school. We took it, we were hooked and that’s 23 years ago, 24—almost 24 years ago. Wonderful! And both you and Tina are still both very much enthusiasts of the hobby? So, you touched on a very important aspect, right away, which most bonsai lovers would like to point out, is that you cannot be afraid of the parting from one of your trees. Is that correct? That’s right! Our experience is probably like 99% of other people who have ever had one, tried it, without knowing what to do. It’s so easy for one to die. But you can’t be stopped from pursuing bonsai if you really love the art. Absolutely, I agree! What if you were to give somebody like me or anybody who is listening to us, who is new to the art, a set of two, three, four recommendations on how to get started? What to do; and above all, what not to do? 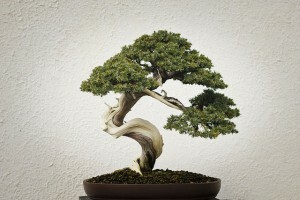 The first thing is to understand that bonsai is not a specific plant. All kinds of plants can be trained, developed, designed and maintained as bonsai. So number one, it’s not just one kind of plant. Number two: the majority of plants used as bonsai are outdoor plants, can remain outdoor plants even after been trained and potted up as a bonsai. They’re outdoor plants. So if you don’t have access to outdoor growing space, then you have to consider one of the tropical plants that can survive, not thrive, but survive indoors during the cold weather. They want to be outdoors. Tropical plants want to be outdoors in the summertime—hot, humid—we have a great environment in North Carolina, this Piedmont area in North Carolina. People think that bonsai is difficult. I’d said that any hobby that you don’t know how to do is difficult. But in bonsai [it’s] horticulture first. If you understand the needs of growing plants: sunshine, water, air, nutrients, then it’s not difficult. But be sure and understand know how to grow and train bonsai—how to grow and train any plant. Then you can be successful in bonsai. Keep it alive first, then, create a beautiful design. One of the common questions asked of us when we are displaying bonsai for the public is, “How old is that plant?” Interesting, in bonsai it’s not a matter of factually how old something is. It’s how old the viewer perceives it to be, because we do everything we can to create the image of an old tree. Even though it’s only two years, five years, twenty years, we’d love it to look to the viewer as if it’s 75 or 100 years old. Good point! Excellent point! So, what about malls and stores? Usually they are not artistically styled. They are not potted in a medium—a growing medium of soil that’s good for their long term health. So I encourage people, if they are given one, that they link up to their neighborhood bonsai club, get advice on how to get it properly planted and if they’re out to purchase one, contact their local bonsai society. For instance, Triangle Bonsai Society has a website. It’s very difficult to remember the web address: TriangleBonsai.com. Go there. We have folks who can provide you with healthy trees, planted appropriately, and most of all, a group of people who are interested in bonsai will help you care for it. Wonderful! That’s exactly what a beginner needs, right? Let’s talk about specific species. So, if you were a beginner now, what are the top two or three type of trees that you would focus on? Beginners can seldom do wrong by having a juniper bonsai. Juniper is very hardy. It’s happy in our environment. It’s readily available at outdoor stores. They are readily, also, from people who have grown plants for bonsai. But, they’re kind of limited. Their color is green. Well, if it’s healthy, it’s green! [Laughter]. If it’s brown, it’s not healthy! But I love for people to look at some deciduous trees. Maples are readily available. You can start with something that you dig as a seedling from your yard and learn how to care for it and keep it alive—no cost to you. If it should happen to die, and especially if you understand “why” it died, then you are on your road to be a successful grower of bonsai. I like for people to have something colorful like an azalea. And azaleas are readily available. They are maybe not grown for bonsai, so they are a little bit more of a shrub, but their color when they are in bloom—you can forgive them for a lot of faults when they are in beautiful color. Those are three that I think people new to bonsai could enjoy as trees that need to be out of doors almost exclusively. Only bring it in if you are showing it off to a friend for a day or so. If you want to have a plant that can survive indoors, in the winter in our climate, then look at the ficus family, the fig family. There are several varieties that work well, have smallish leaves and I would encourage people to look for a ficus, schefflera—readily available, pretty common. [They] don’t make classic bonsai, but for someone new in bonsai, place to practice keeping something alive. If you want to get more exotic, you can get bougainvillea—takes a little more care. If you have a greenhouse, especially, great plant to begin with. I think those three plants, I’ll call them outdoor bonsai, and then the three indoor, although I’ll encourage you, if you have a tropical plant, keep it outdoors from the moment nighttime temperatures are above 50 degrees until fall when they start falling below 50°. You touched on a very important point there which is the cost. It doesn’t sound like starting in bonsai is as expensive an activity as people think? It is not an expensive hobby. You can purchase plants that have been partially trained as bonsai from a couple of national retailers. They are shipped to you. They are going to be a reasonable good soil mixture. They are going to be in a bonsai looking container, for less than $50. But you can also, maybe find a local person or local club where you can find a bonsai for less than that, and get started. Tools for bonsai—you can become a tool collector and forget about growing the trees, there are so many tools that you can have. But really, basic tools a bonsai enthusiast would use would be a pair of shears—just good old solid shears which can be purchased at local sources. Or you could go online and purchase some that have been designed to be used for bonsai. There is also a tool unique to bonsai—you don’t have to have it to begin with—but ultimately you’ll have one and that’s called a concave cutter. That’s something that lets you approach the trunk and cut the branch even with the trunk. We know with a pair of scissors, you can get no closer than the width of the blade. [If you] want to learn how to design a tree by shaping it, bending branches, then you’ll need to have bonsai wire, which can be either aluminum wire—plain old aluminum—or you can have anodized or colored aluminum, specific for bonsai, kind of blends in that way. For someone more advanced, working with a heavier limb material, copper wire is used. Then you would need some kind of wire cutter—a pair of pliers, but pretty easy to get started. Bonsai supplies are available through the Triangle Bonsai Society, through three members who have business of selling supplies. They don’t have physical locations in Raleigh, but they can make sure that you get what you need. It’s about “pots”. It looks to me like, from the experience that I’ve had so far, that the world of pots is almost a world of its own. Or, I say “pots” when I should really say “containers”. Bonsai pots or bonsai containers have a design that has feet to elevate them off of a flat surface, especially if the surface is not porous and then like wire or a grate of some kind, and they need to have nice drain holes. People forget that all plants need to have access to a lot of air to their roots. And so the bonsai soil we use is very porous, so if you pour water in, it flows through, some of it’s retained for the plant to use and the balance comes out the bottom through the drain hole. That creates a healthy plant. If it stays in the bottom of the container, then root rot will surely follow and the plant will die. Someone brought an azalea to me yesterday and the tips of the azalea leaves were brown. And they said, “Well, what’s wrong? I’ve been keeping it watered.” And I said, “That’s the problem. It’s a saturated soil; it’s not draining, so you’re seeing a sign that there’s too much water and the plant will rot and die.” So bonsai pots: you can get training containers that are plastic, or you can get ceramic containers glazed or unglazed, there are some good guidelines about whether you use a glazed container or an unglazed container for a specific kind of plant. We like to put evergreen, junipers, pine trees in unglazed so that the contrast of the green with the brown or tan or reddish part of the pot maybe also the bark works well with that color of container. We like to choose a container for a deciduous tree to maybe match springtime leaf color, fall leaf color. If it flowers, we like to have something that contrasts. Look at your color wheel. Choose something opposite side of the color wheel from the color of the flower or the leaf. Wonderful! Let’s get into a bit more detail about bonsai soil, bonsai mix. Typically according to the current understanding, what are the components of a good bonsai mix? The bonsai community has moved away from having any organic components in bonsai soil. Now, an organic component would be some kind of bark. Preferably composted bark, which means it had started breaking down, so it’s not robbing nitrogen from the plant, as the break-down steals the nitrogen. So we use something that’s a particle that, one may not have any water-holding properties. It might be a bit of sand. It might be a little bit of granite grit from right here in North Carolina mountain area. Doesn’t hold any water—maybe a tiny bit on the surface, but it does provide substance for the roots to cling to and grow around. Then pumice, which is a volcanic material. It is porous, it does hold some water. It’s also light in weight, so that’s a good component to add. We can also use another volcanic material that’s a harder rock—it’s not soft like the pumice. That, too, has lots of holes, so it’ll provide air space as well as hold some moisture. The bonsai community, who are serious growers, use a product imported from Japan, which again is a volcanic product, but it’s highly fired, doesn’t break down and is called akadama, a-k-a-d-a-m-a, and for azaleas, especially azaleas that have been imported from Japan that have only known soil that is found in Japan: kanuma, k-a-n-u-m-a. We use kanuma for our azaleas. Holds moisture, the right amount that azaleas like, and slighty prone to acidity, which is something azaleas like. Once you become a little more serious in bonsai, then you may want to look at the specialty soils imported from Japan. Our local vendors can provide pre-made soils, so you don’t have to go out and look for the components. Some of us who have a number of trees may be buying the components in 100 pound bags and mixing our own soil, but for the person new to bonsai—1, 2, 3, 4 trees—much easier to get a pre-mix soil from a local vendor. One more question on the agricultural aspects of art, which is, what kind of special needs, if any, do bonsai have when it comes to fertilization or treatment for pests or diseases? I’ll talk about even more than what you have asked about. Juniper pine bonsai are sun lovers. So you need to know that you have a place that can provide adequate sun. If your deck—or you might want to keep your bonsai heavily shaded—they won’t do well, so don’t look for juniper if that’s your environment. Look for an azalea or a maple. Fertilization, watering, pests, diseases—let’s look at disease first. Azaleas develop root rot very easily. You need a well-draining soil. The best thing to do is to not overwater. Do prevention. Pests—pests love our little trees and they can do a lot of damage real quick. Best idea is to prevent, and sometimes I find that when the pests are emerging and start to chew on everything thing. My attention is to spray them off or whatever. I don’t need to turn to chemicals. My last recourse to either disease or pests would be a chemical. For junipers, we have this little critter that is called spider mites. They will infect a juniper. But if you blast the juniper foliage with streams of water, every time you water, you can prevent them from ever occurring. Because you just knock them off and don’t provide a hospitable environment. Watering—people say “Well, how often do you water your bonsai?” I say, “When they need it.” And they say, “Well, what do you mean, ‘When they need it?’” And then I go to my favorite answer, “It all depends: it depends on whether it’s 100 degrees out or it’s 50 degrees, it depends on whether it’s sunny or cloudy, windy or not windy.” The best way to determine if your bonsai needs watering is to look in the soil by sticking your finger in it or a chopstick. See how close to the top of the soil surface you can find moisture. If it goes more than 3/8” or ½”, then I’m probably going to want to water. Prevention of pests doing damage or disease hurting plants: if you identify what the problem is, then that might mean you have to do a little research on your computer or ask someone who knows, or bring it to a Triangle Bonsai Society meeting and say “What am I dealing with?” And then get the specific remedy and not just try something shotgun and hope it works. Well, thank you, Harold. It was a most interesting conversation. I’m sure we’ll have a chance to record phase two of our conversation as my level of expertise slowly increases. Maybe we can have another interview like this on more advanced topics.